Taken on the Booroo, Isle of Man. Dogfish are essentially small sharks. The skin, once used as sandpaper, feels quite smooth if stroked from nose to tail and very rough in the opposite direction. Dogfish hunt at night, feeding on crabs, whelks and bottom-living fish like gobies, dabs and gurnards. They rely heavily on smell when hunting and may follow a scent trail even when their prey has doubled back and swam right past them. 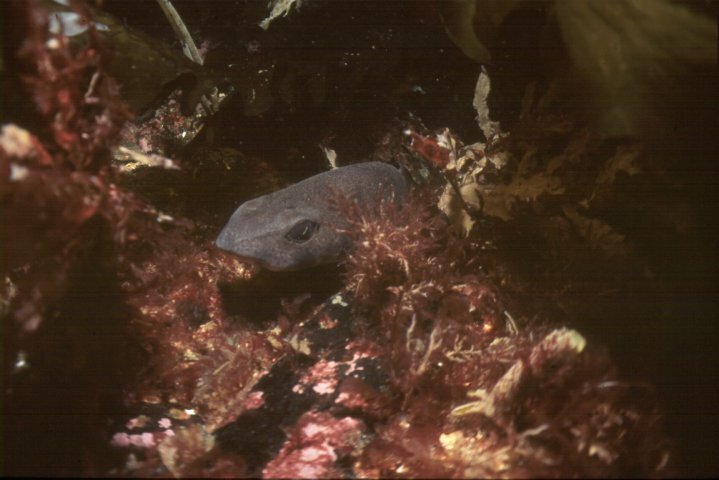 For more on diving the Booroo see our Isle of Man section. Dive sites and marine life of the Calf of Man and neighbouring area by Bill Sanderson, Bruce McGregor and Andrew Brierley, Immel Publishing Ltd, 1994, Paperback.